One of the tools nutritionists use is a set of food models. When the plumber comes to your house to fix that leaky sink or toilet, undoubtedly he brings a box loaded with tools -- wrenches, screwdrivers, drill bits, hammers...all in varying sizes, too! You wouldn't expect anything less. Its the same with nutritionists. Even though the tools used may not all be tangible, they are tools nonetheless. The variety of tools in a nutritionist's toolbox, just like the plumber's, is essential to a job well done. Nutritionists are experts at teaching people how to manage their diets to prevent or treat disease. Learning how to eat to be healthy is the goal of a person who consults a nutritionist. To do his or her job, a nutritionist must first of all be well educated in the science of food, the nutritional composition of food and how nutrients are digested and absorbed. They also must be knowledgeable about disease states, and the dietary modifications needed to treat or manage those conditions. Nutritionists work in a variety of settings, such as hospitals, assisted living centers, health departments, schools and colleges, insurance companies, food companies, athletic teams, marketing firms, restaurants, and publishing firms. They also function as private practitioners. 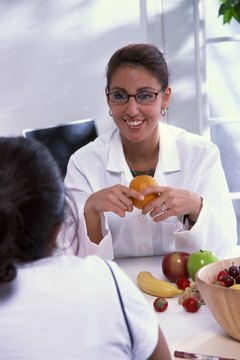 Because of the wide range of opportunities available, nutritionists often specialize in a given area, such as sports nutrition, food service management, diabetes, weight loss or eating disorders. Also in the nutritionist's tool box are excellent oral and written communication skills. Often nutritionists teach and facilitate groups, so they are well versed in public speaking. Meeting the needs of individual clients is integral to a nutritionist's job, too, so counseling and coaching skills are other tools in her toolbox. Techniques such as behavior modification, food journaling, motivational interviewing and reflecting listening are significant tools of the trade, regardless of her area of specialization. A nutritionist is a learner, one who stays abreast of current research in the field, which changes quite rapidly. Analyzing diets and making recommendations for improvements is integral to the work a nutritionist does. She knows about food and its nutritional content, yet she also relies upon nutritional analysis to supply more details, for example, how many milligrams of zinc that 4-ounce portion of spare ribs contains. There are a number of software programs that nutritionists use for this, as well as nutrient databases, such as the one provided by the U. S. Department of Agriculture. Mathematical equations and tables for calculating body mass index, ideal weight, basal metabolism and calories expended in physical activities are other tools that a nutritionist frequently uses. The Institute of Medicine Dietary Reference Intakes are another tool used to assess the diet quality of clients. Teaching individuals about portion size is another important aspect of a nutritionist's job. Recognizing the difference between healthy portion sizes and how much a person actually eats can be very eye-opening, especially when weight loss is the client's goal. To do this, food models are a tool commonly used. Food models are replicas of foods in a specific portion size that the nutritionist can use to visually assist clients with food choices and menu development. These can be physical, as in the case of plastic or cardboard models, or they may be available online as virtual models. How Are Proteins & Carbohydrates Alike? 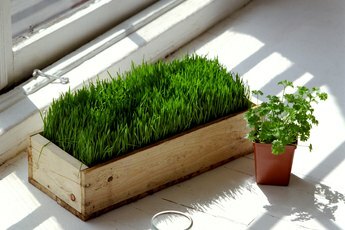 What Are the Nutrients in an Ounce of Wheatgrass?